COWBOYS OFFENSE — OVERALL (27), RUSH (5), PASS (28). COWBOYS DEFENSE — OVERALL (7), RUSH (8), PASS (9). FALCONS OFFENSE — OVERALL (6), RUSH (30), PASS (2). FALCONS DEFENSE — OVERALL (30), RUSH (21), PASS (30). STREAKS, STATS AND NOTES __ Falcons won last three games in series, including home games in 2017 and 2012. … Cowboys’ last win over Falcons came on Oct. 25, 2009, 37-21 at Dallas. … Cowboys looking for second straight 2018 road win following 0-4 start away from home. … Ezekiel Elliott second in NFL in rushing, behind Rams‘ Todd Gurley, after 151 yards rushing and 187 scrimmage yards against Eagles last week. … DE DeMarcus Lawrence leads Dallas with 6 ½ sacks. He had sack in last meeting and looking for third straight game against NFC South team with sack. … WR Michael Gallup averaging 18.3 yards per catch, second highest among NFL rookies. … LB Leighton Vander Esch third among NFL rookies with 74 tackles, including team-high 13 last week with first career interception. … Former Falcons DE Adrian Clayborn had six of team’s eight sacks in last season’s win over Cowboys. … QB Matt Ryan has seven games with QB rating over 100 and six games with more than 300 yards passing this season. … WR Julio Jones fastest player in NFL history with more than 10,000 yards receiving, passing mark in 104th game last week. Calvin Johnson reached 10,000 yards in 115 games. 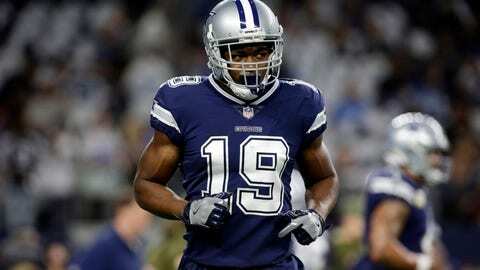 … Jones leads NFL with 1,040 yards receiving. … S Damontae Kazee had NFL-leading fifth interception last week, career high. … Falcons’ 51.3 percent success on third downs ranks second in NFL, behind Colts‘ 52.4, and is highest in franchise history. … Fantasy tip: Dallas QB Dak Prescott is taking greater advantage of his running skills. Prescott passed for 270 yards with TD and ran for TD last week. He has nine TDs, six passing and three rushing, in last four games.